Who are the greatest power forwards of all time? Former NHL head coach and player Barry Melrose starts a new gig this season: He will be blogging for NHL.com throughout the 2011-2012 campaign. There is a certain criteria a player has to fulfill to meet my definition of a great power forward. He has to be a frontline player, he has to be very physical and he has to fight. A power forward to me is not just a big guy who scores goals. He is a big, mean, nasty, physical, tough guy to play against as well as being a very good hockey player. During the early 1990s, Wendel was probably one of the three toughest forwards in the NHL. He was scoring 40 goals a year, he was one of the best fighters in the League -- he was just a real physical presence out there. If you look at his numbers he played 793 games, he's got over 300 goals and he's got close to 1,700 penalty minutes. He could hit, he could fight and he could score goals. 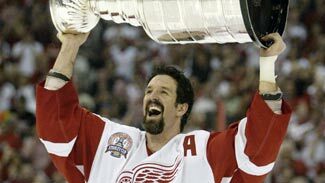 I coached against him in 1993 when I was with L.A. and Wendel was with Toronto and Wendel was their best player. 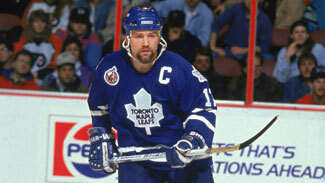 We stopped Doug Gilmour, we stopped Dave Andreychuk, but we just couldn't stop Wendel. It seemed like he scored every game against us. Gilmour got a lot of ink, Andreychuk scored a lot of goals, but to me, Wendel was the heart and soul of that team. I will always remember late in Game 1 of our playoff series against the Leafs in 1993 when Gilmour came across the middle and Marty McSorely hit him with a great check. Wendel came in and he and Marty had what I think was the last great fight in the playoffs. It was late in the game, they already had it won, but here's Wendel still sticking up for his teammates fighting one of the toughest guys in the NHL. Wendel's got more goals than Clark, but Clark's got the Stanley Cups. I think that means something. Look at his numbers: close to 1,000 games, over 300 goals, close to 400 assists and over 1,000 penalty minutes. If anyone knows the 80s and followed that Islanders team -- they had Bossy and they had Trottier and they had Potvin, but they were playing against those Philly teams and most nights Clark Gillies would have been the MVP. He was big, he was tough, he was good enough to play with Bossy and Trottier and he could fight anyone in the NHL to a standstill. Because he has more Cups than Wendel, I have him at No. 4. Back then we said he "kept the flies off Bossy and Trottier". Opponents knew that if anybody did something to them they'd have to answer to Clark and that's what a power forward does. He's a deterrent. He was as tough as anyone in the NHL, but he was also an excellent hockey player. It's not just enough to be a tough guy. You have to be an excellent hockey player, too. Clark Gilles certainly was. Obviously Cam's numbers aren't as high is they normally would be because he was struck down by injuries, but he played over 700 games, he's got 395 goals, 299 assists and more than 1,200 penalty minutes. For a few years he was arguably one of the best players in the NHL. He was scoring 50 goals a year, he was maybe the toughest guy in the NHL, he had a rocket of a shot, and he might have been the best fighter in the NHL for the period of time he was in the NHL. Just a great, great hockey player. Without a doubt, he was one of the scariest guys in that era to play against. If he stayed healthy his numbers, and the Bruins' would have been even more impressive. Don't forget, of the 726 games he played, he was probably on one leg for half of those. He was hurt and he was not 100 percent for most of his career. He still scored more than a goal every two games. If you put him at 1,000 games, he's got 600 goals. This guy was a great goal scorer, and on the list I have, he was probably the best fighter. If these five guys fought, I would have to say Cam Neely would probably be at the top of it. In more than 1,500 games, he was durable, he scored 656 goals, had 698 assists and almost 2,500 penalty minutes. This guy did it over a long period of time. He fought everybody, his numbers are fantastic, he won Stanley Cups -- just a complete, complete player. He might not have been as tough as Neely, but he may have been a better goal scorer. He was also a great passer, tallying more assists than he did goals. What's more is that he came in as an 18-year-old, and he did it from Day 1. As for his current job as the League's disciplinarian, I think how he played and what he went through on the ice give him a better understanding of what is going on on the ice with fighting and hitting. He's been there. He's done it. He knows what's going through the minds of tough guys and why they're fighting at that point of the game. He can tell when a fight is done on purpose or when it's done as a tool by the coach. I think Brendan, his career and what he went through as a player and how he played will make him better qualified for that job than a lot of people would have been. This may be a surprise, but I think this guy was the first great power forward. More than 1,700 games, 801 goals, over 1,000 assists, but I don't know if people realize that he's got close to 1,700 penalty minutes. And he was big. In Gordie's era when he first came in, hockey players weren't very big. They'd be 5'7", 5'8", 5'9" ... Gordie was 6'2". I played against Gordie when he was in his 50s in Houston. The first thing that struck me when I saw Gordie on the ice was how big he was. He was still nasty and shifty. I can't imagine what he was like in his 20s. He was big, he was mean, he would fight, obviously he was one of the greatest goal scorers we've got in our sport and he was a great passer. If you look at power forward in the dictionary, there's probably a photo of Gordie Howe next to it. You watch film of back in those days and he towered above guys. You see him going to the net and the D can't handle him because he's so big, so powerful and had a rocket of a wrist shot. I played against Gordie and I know. You knew where he was at all times -- and you did that because it was for your own safety.